Jarrod Washburn pitched a one-hitter on Monday, striking out three and walking none. Whenever a pitcher throws a no-hitter or one-hitter his defense has, by definition, played a great game, but by only striking out three Washburn relied especially heavily on his defense Monday. The defense converted 25 balls in play into 24 outs. It is widely believed in sabermetric circles that pitchers have a lot of control over if a ball in play is a groundball or not, but beyond that exert a marginal amount of control on how field-able a ball in play is. If you agree with that assessment then a large share of the accolades that have been given to Washburn for his performance should go to his defense. Although Washburn deserves a lot of credit for facing 28 batters and walking none, and he doesn’t have to share that with anyone. The 25 balls in play were 11 ground balls, eight fly balls, five line drives and one pop up (based on the GameDay classifications). I plotted the location of these balls in play over a crude map of Safeco field that I made also made from the GameDay data. I found the average out percentage for a ball in play in each location from 2005 to 2008 at Safeco Field to roughly indicate how hard each defensive play was to make. This method only takes into account the location of the ball in play, not how hard it was hit, or even what if it was a ground ball, fly ball or line drive. Obviously this is in no way a substitute for the sophisticated fielding metrics, like UZR, but, rather, a quick and dirty way to give some credit to Seattle’s fielders. The GameDay locations are determined by a person estimating the location where a ball was fielded, so there is most likely some error. Again the location recorded is where the ball was fielded. The one hit actually landed farther in front of left fielder Ryan Langerhans where he had no chance of fielding it. Also keep in mind the estimated out percentage is only based on the location, not type of ball in play. The pop out in shallow-right field was relatively easy out for Jose Lopez to field even though it was to a location of generally low out percentage. 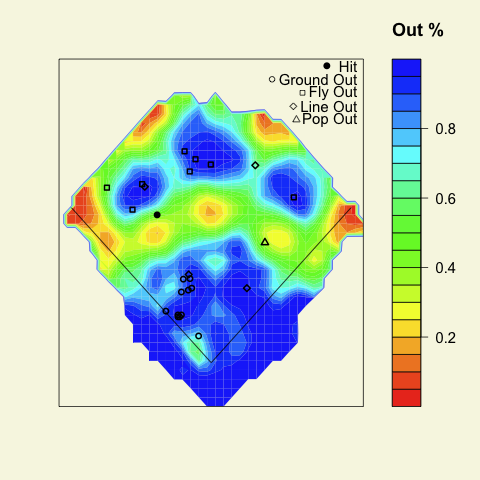 The blob that looks like a hit at third base is just a lot of ground outs to Chris Woodward. These include barehanding a Adam Jones slow roller in the seventh and a nifty play on the last out of the game, a Brian Roberts ground ball down the third baseline. The line drive to the center-right gap was fielded by Ichiro Suzuki in the 2nd inning. Washburn got into the action, fielding a Melvin Mora bunt in the third. You can also see the luck involved in the one-hitter, line drives were hit right at Russell Branyan and Ronny Cedeno that could very easily have been hits if they had gone to slightly different angles. So props to Washburn for his excellent control over nine innings, but don’t forget to give a big dose of credit to the Seattle defense as well. We hoped you liked reading A Little Help From His Friends by Dave Allen! What a great job by the Mariners front office. The defense for the team has been great, and it not only has helped them play better, but also incredibly raised the market value of some of their pitchers. However, since they are 3 games over .500 (and after the game this article is about), it may be tough to sell the fan base on trading Washburn.